Grease and line the base of a 15 cm loose-bottomed or spring-clip cake tin. Crush the biscuits to a crumb either in a food processor or in a plastic food bag using a rolling pin. Melt the butter and mix into the biscuits. Tip into the cake tin and pack down with a potato masher or the back of a large spoon. Melt the chocolate in the microwave gently or in a bowl over a saucepan of simmering water. Once melted, leave to cool for 5 minutes before adding the cream cheese. Mix in the eggs and then pour on top of the cheesecake base in the tin. Mix the coffee granules/ powder with the caster sugar and 1.5 tbsp of hot water until dissolved. 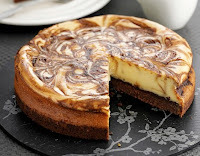 Spoon over the top of the cheesecake and swirl with the handle of a teaspoon. Place the tin on a baking tray and bake in the oven for 1 hour, until the middle of the cheesecake is just set. Remove from the oven and leave to cool. Serve at room temperature, with pouring cream if you love too.